As I'm new to chemosensation, I have been reading papers from prominent labs in the field. In the previous post, I briefly reviewed two papers from John Carlson's lab, which studies olfaction in flies. 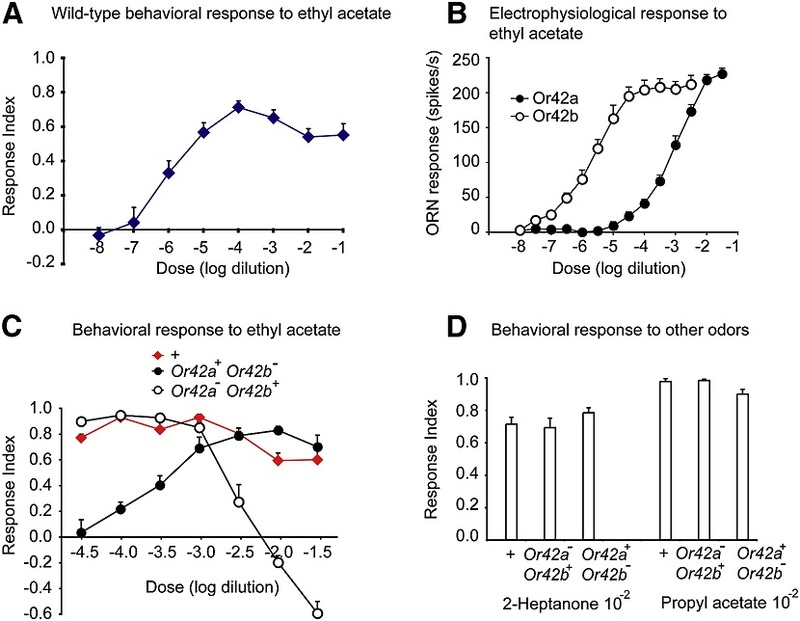 Those papers established an "empty neuron" system that allows one to express arbitrary odorant receptors (Ors) and record from their olfactory receptor neurons (ORNs); and described the receptive field of a subset of larval Ors. In this post, I'm going to review two more papers that flow from that start. As I just mentioned, the Carlson lab used the empty neuron system to look at how some Ors responded to odorants. To follow this effort, Kreher expanded the odorant receptor-odorant search to 25 identified Ors, and a wide variety of odorants. Of the 25 putative Ors, 21 responded to one of the odorants. At 10-2 dosage, 20% of the Or-odor pairs were responsive, but at 10-4 dosage, only 4% were responsive. They plotted this in terms of "tuning curves," and showed that Ors are more narrowly tuned at lower concentrations than high concentrations. They further looked at the representational distance between odors by composing 21-dimensional odor response matrices, and looked at the distance between odors in spikes/s. Odors with vaguely similar structures were closer than dissmilar odors (like aliphatics versus aromatics). They reuse this odor distance a little bit later. To characterize the behavioural response to the odorants, they placed larva in a petri dish with the odorant on one side of the petri dish. The 26 odorants elicited a range of attraction and repulsion, generally skewed towards attraction. While this gets at behaviour, this does not give a sense for perceptual similarity. To look at that, they used a masking paradigm, where they placed an odorant A on one side of the dish, and put a masking odorant B throughout the petri dish. Here they found that certain odors were able to mask each other, indirectly showing perceptual similarity between them. Larva are attracted to 2-Heptanone unless it is masked by e.g. 1-Hexanol; masking implies perceptual similarity. From Kreher et al, 2008. Then, given that they had the odor representation distance, and the perceptual distance, they plotted them against each other and saw a correlation. In other words, odors that we perceive as similar elicit similar responses even at the level of odorant receptors (not upstream). Odorants which mask each other are closer to each other in odor representation space. From Kreher et al, 2008. Finally, they noticed that an odorant, ethyl acetate (EA), elicited behaviour over a wide range of odor dilutions (panel A, below). 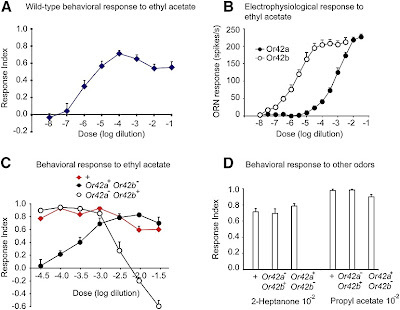 When they checked their Or response matrix, they found that only two receptors, Or42a, and Or42b, responded to EA. They then tested the two Ors' concentration dependence, and found that Or42b had a lower EC50 than Or42a (panel B below). To see whether these two Ors combined to code EA for the larva, they knocked out each receptor individually, and performed the behavioural assay. Or42b KO larva did not respond to high concentrations, while Or42a KO larva did not respond to low concentrations. The larva's ability to detect EA was entirely determined by these two Ors. Or42a/b combine to code for ethyl acetate. From Keher et al, 2008. Phew! What a paper. 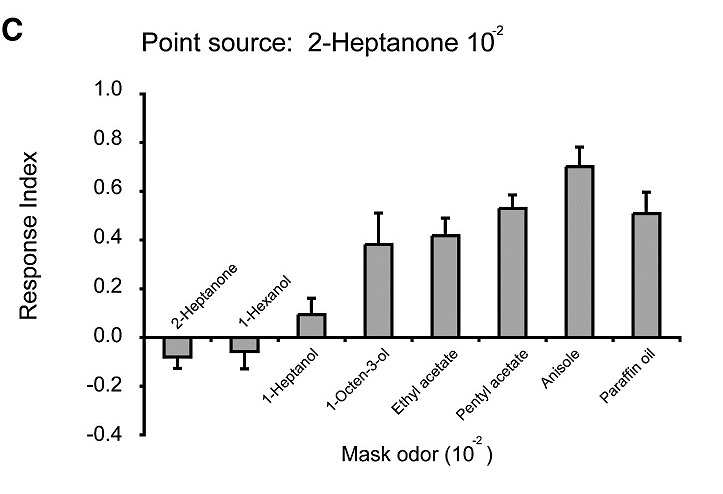 The first really cool finding here is that odors that are perceived as similar are also represented in the brain as similar, at least on the level of odorants. This may seem obvious, but it is not necessarily so. For example, think of the perceptual class of "floral." Floral odors probably share some components, but the overlap is not complete. 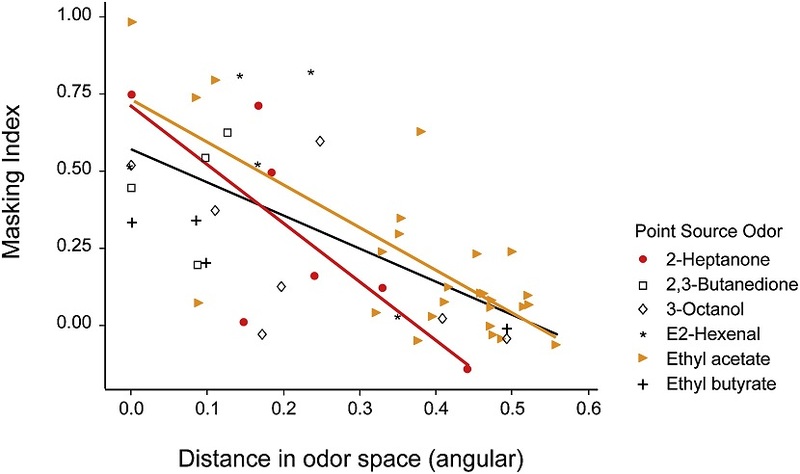 Before this paper, it was possible that the differences between floral odors was large enough that they might activate different sets of receptors, and that the "floral" categorization occurred as a higher order process. 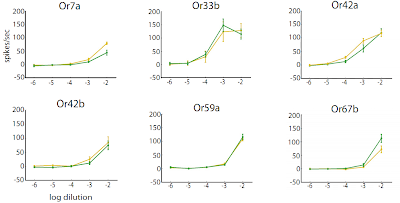 Instead, ignoring what happens in higher order neurons (which are pretty obviously important given the noisiness of the correlation), there already is an overlap in represenation and perception at the level of the odorant receptor. The other interesting thing here is how ethyl acetate's representation seems to be dictated by just two receptors. We normally thing of compounds activating ensembles of receptors, and our brain decoding these ensembles into percepts. Here, though, the ensemble is one neuron. It would be interesting to see if mammals, with more odorant receptors, similarly code for some compounds on single receptors, or if the coding is tangibly different. And finally we get to the paper that led me down the trail, Montague et. al. 's study of pyrazine representation. Whereas Kreher looked at a wide set of odorants, Montague focused on a small subset, the pyrazines, which are physiochemically similar (they used Noam Sobel's idea of physiochemical space, which is what attracted me here). And they found that while pyrazines are clustered in physiochemical space, their representation is somewhat more different in ORN space (pyrazines were closer together in spikes/s than dissimilar odors, but more spread than you might expect from the physiochemical clustering). There were a few cool points, though. First, in Kreher 2008, they found odor responses in 21 of the 25 Ors. In Montague, they found that one of the previously unresponsive Ors, Or33b, responded to pyrazines. Rather than being non-responsive, it was simply highly tuned. 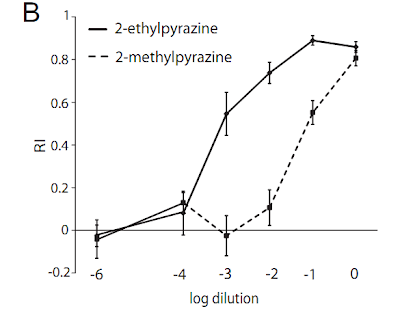 2-ethyl- and -methylpyrazine elicit different behaviour responses. From Montague et. al., 2011. 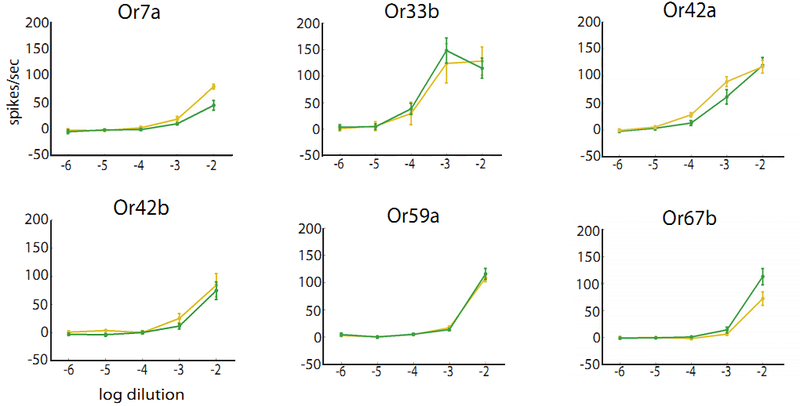 Then they reexamined the ORN response over a wide range of dilutions, and found they were indeed quite similar (see below). They analyzed the temporal responses as well, and found that the temporal profiles were also similar. So these two pyrazines, which elicited different behaviours, seemed to be encoded by the ORNs almost identically. Of course, the small differences they did observe could be amplified by higher order neurons to distinguish the two odorants. 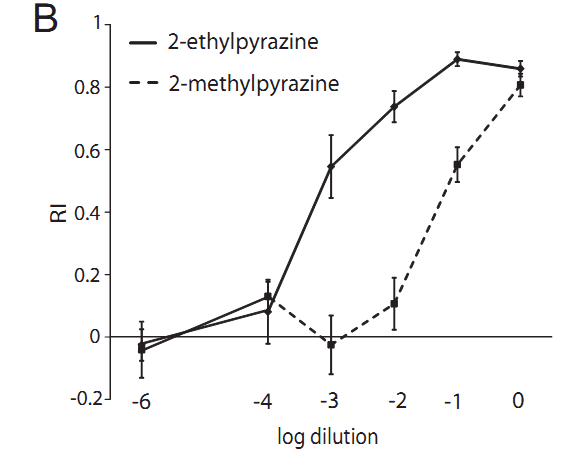 2-ethyl- and -methylpyrazine (green and yellow) elicit similar ORN responses over a range of dilutions. From Montague et. al. 2011. The last cool thing of the paper is that they reported "super sustained" responses from ORNs. Most ORN responses last for a few seconds at most, but these super sustained responses could last for minutes. They didn't have a really good explanation for this. In lab meeting, one guy mentioned that it could be due to differences in the second messenger cascade given this is an empty neuron system. Pyrazines can elicit "super sustained" responses in ORNs that last over minutes. While they could not mechanistically explain why super-sustained responses happen (that's probably the next paper), they had some cute theories of what they could be useful for. They could act as a sort of short-term memory, so that a fly could remember encountering a pyrazine within the last minute. Or they could also act as a consistent inhibitory input to neighboring glomeruli, and alter processing that way. That's the end of this hike along the paper trail. Having read this series of papers (and skimming a few others), I have a much greater appreciation and understanding of how ORNs may respond to odors, how narrowly tuned they are, and how the perceptual code starts to form at the level of the receptors. The next step will be to see how this is processed in the glomeruli, and in mammals. Kreher S a, Mathew D, Kim J, Carlson JR. Translation of sensory input into behavioral output via an olfactory system. Neuron. 2008;59(1):110-24. Available at: http://www.pubmedcentral.nih.gov/articlerender.fcgi?artid=2496968&tool=pmcentrez&rendertype=abstract [Accessed August 9, 2010]. Montague S a, Mathew D, Carlson JR. Similar Odorants Elicit Different Behavioral and Physiological Responses, Some Supersustained. Journal of Neuroscience. 2011;31(21):7891-7899. Available at: http://www.jneurosci.org/cgi/doi/10.1523/JNEUROSCI.6254-10.2011 [Accessed May 26, 2011].